A new state-of-the-art multiscreen cinema worth €5.5 million has opened in Omagh. The cinema is the latest addition to Ireland’s largest multiplex chain, which is located at the former Desmonds factory site on Kelvin Road. The new facilities include one of the company’s flagship OmniplexMAXX screens, which is the largest in the country standing at 18.7m x 10.2m. The complex can hold over 1,100 at capacity inside the 35,000sq ft site, which also includes a number of restaurants. 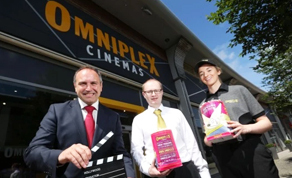 "The addition of our largest OmniplexMAXX screen means that the people of Omagh and surrounding areas can claim one of the best cinema experience offerings in the country. Today cinema has become so much more than simply watching a movie. Bespoke leather seating, designed with the utmost comfort in mind, the size and structure of the screens along with the latest in high tech sound technology, help transport the viewer into what becomes a completely immersive film experience in an Omniplex Cinema,"
Established in 1991, Omniplex Cinemas has become Ireland’s largest multiplex cinema company with over 222 screens across 25 Irish cinemas - Thirteen of which are in the Republic of Ireland, while the other fifteen are located in Northern Ireland. Omniplex Cinemas recently sanctioned a €14.5 million investment into the refurbishment of its current multiplexes, which also saw the rollout of the company’s new OmniplexMAXX screens format across a number of its sites. This news comes following the recent announcement that Vue Entertainment had acquired the Irish cinema chain Showtime Cinema, which saw Vue Internatinal continue its expansion into the Irish cinema market with the addition of the Showtime facilities in Limerick & Ashbourne.